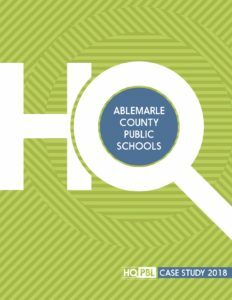 Without a doubt, Project Based Learning in Albemarle County Public Schools is there to stay. From impressive outcomes, both in project products and on state assessment measures, teachers, students and families are seeing the results of high quality PBL (HQPBL) student experiences. Most projects in ACPS are tied to the local area, a region of the country rich with history and culture, and invite students to explore their own community. From Elementary students at the local schools investigating attractions and writing to the Mayor — all the way up through high school where students are considering what makes memorials important to society — there is no lack of authenticity and collaboration. Students not only work on projects tied to a real cause or community issue, but they also engage with the community and solicit feedback, advice and expertise to improve their public products. Throughout all of the HQPBL experiences in ACPS, there is real attention to helping students learn how to manage their work on their own, reflect on what they have learned and keep track of their own progress. This is evident across school sites and examples of projects. We learn from teachers and students at Woodbrook Elementary School and Western Albemarle High School that HQPBL experiences are fueling excitement and engagement in K-12 classrooms. Although challenging work, the dedication to authentic, challenging and collaborative project experiences is worth it.